West Shen’ was one of two houses built for Edmund Cullimore on land adjacent to his own house, Shen, which is thought to have been built about 1891. The two houses, West Shen (or 28 Gloucester Road) and The Elms (or 26 Gloucester Road) were built in 1895/6. In Gloucester Records Office an Abstract of Title has a memorandum referring to the fact that Edmund Cullimore was arranging a transfer of an existing mortgage to two freehold villas and gardens in Gloucester Road, Thornbury. In this memorandum, dated November 1896, the two houses were referred to as ‘Cefyn House’ and ‘The Tarn.’ We believe these must have been the original names given to the two properties we now know as West Shen and The Elms. 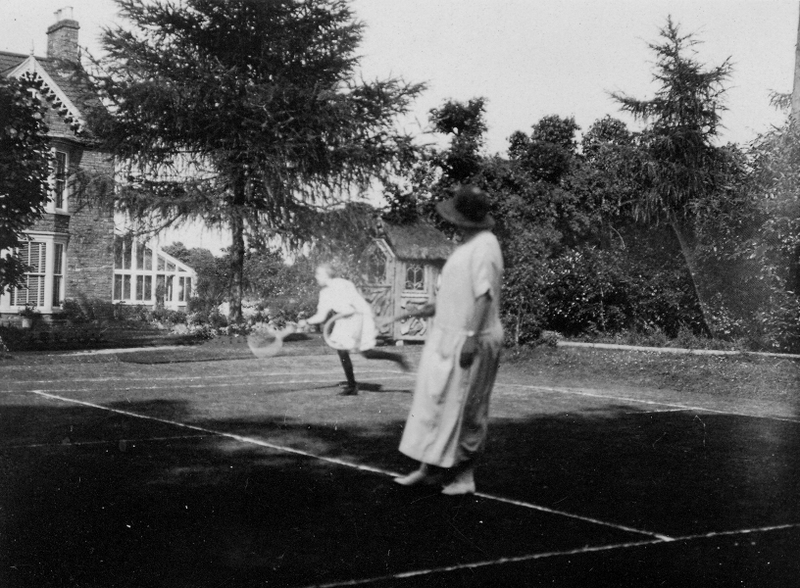 The advertisement makes mention of the Tennis Court which featured a lot in the social life of Thornbury. it was obviously used to play tennis but under the auspices of Helen Grace it often became the venue for amateur dramatics of various sorts and displays of dancing. In an interview given to the Thornbury Oral History Society in 1994, Edmund’s Cullimore’s grand-daughter, Sally Gordon said that Edmund built West Shen and The Elms for ‘her mother and father to live in’. We cannot say whether that was true – it was about 10 years after being built that her parents, Francis and Helen Grace, moved into West Shen. Indeed the newspaper advert shown on the right which was published in the Bristol Mercury on 29th February 1896 shows that Edmund attempted to sell or let the two houses. In the case of West Shen, the property was let until it was required by the family. Harry Potts. Harry was a veterinary surgeon. We believe he must have moved in shortly after the construction of the house in 1896. An entry in the records of the National School in September 1896 shows the address of Harry Potts as ‘Gloucester Road’ and we know that Harry was occupying the house in the 1899 Rate Book. The 1891 Census shows that he was living in Dalston in Cumberland where he was lodging and working as a veterinary surgeon. It seems lively that he married Marian (or Maria or Marianne) Harker in Lanchester in County Durham in 1894. The record of their marriage calls Harry Potts ‘Henry’. The 1901 census shows he had left West Shen and he was now living at Thornbury Cottage in Castle Street near the junction with Kington Lane. Harry was described as an assistant veterinary surgeon aged 35 from Ipswich and he was living with his wife Marion (or Marianne) aged 34 from Carlisle and their children: Mary G aged 11 born in Carlisle, Harold Joseph aged 7 born in Fairford, Gloucestershire and Elizabeth H aged 5 born in Malpas in Cheshire and a niece and nephew, Catherine A Armstrong aged 18 and Leonard W Armstrong aged 15, both born in Carlisle. The family had obviously moved around fairly frequently and the same is true in the time they were in Thornbury. The 1905 rate book shows that they were then living at Epworth House in Castle Street. They also continued to have several more children whilst living in Thornbury: Mildred St Clair was born in 1903, Constance Marion in 1905 and Charles Edward in 1906. By the time of the 1911 Census the family had moved to Bridgwater. Marianne Potts died in the Bridgwater area in 1932 and Harry H Potts died in 1948. Harold Joseph Potts. Harold was born in Fairford Gloucestershire. His birth was registered in Cirencester in 1893. A Gazette newspaper article dated 29th July 1916 shows that that Harold Joseph was given a commission in the 23rd London (East Surrey) Regiment, his father was described as ‘Harry Potts, a veterinary surgeon of Bridgewater, formerly practising in Thornbury’. In 1924 he married Muriel Louise Goddard in Oxford. Mildred St Clair Potts was born in Thornbury in 1903. It seems likely that she married Sydney Rich in Keynsham in 1921. Constance Potts was born in Thornbury in 1905. Charles Edward Potts was born in Thornbury in 1906. In the 1901 census West Shen was unoccupied. Francis Henry and Helen Garfield Grace – in an interview given to the Thornbury Oral History Society in 1994, Edmund’s Cullimore’s grand-daughter, Sally Gordon said that Edmund built West Shen and The Elms for ‘her mother and father to live in’. We cannot say whether that was true – it was about 10 years after being built that Francis and Helen moved into West Shen. Francis and Helen were married in 1907 and they appeared to move into West Shen at that time. They were there in the 1911 Census when Francis was described as a timber merchant’s foreman. They carried on living there up to the time of the death of Francis in 1949. After this time the house appears to have been converted into flats and Helen occupied one part of the house. The 1949 and 1954 electoral registers show that Mansell Arnold James and Lettie Ray James were sharing West Shen with Helen. The 1959 and 1960 electoral registers show that Brinley C Jefford and Florence M Jefford had replaced the James family, and the 1965 register shows Harriett Gwilliams lived in the ‘Top Flat’ and Edith W Bennett is also listed as living at West Shen with Helen Grace. Sally Gordon – On 5th April 1974 Edmund Cullimore Grace (as the last surviving testator of Edmund Cullimore’s will) conveyed West Shen to Sally Gordon for £12,000. In 1984 the Courtneys expanded the garden of West Shen by buying a piece of land from the Eastons who were living at Shen. The Courtneys only stayed in the house for three years and on 3rd January 1986 it was purchased from them by Dr Peter John Burney and his wife, Vivienne Joan. Dr Burney had moved from Lancashire to join one of the practices at Thornbury Health Centre in 1981.